Anne Hutchinson being judged by fellow Christians of rank – a 1901 painting by Edwin Austin Abbey. Therefore, take heed how you proceed against me. For you have no power over my body. Neither can you do me any harm, for I am in the hands of the eternal Jehovah my Saviour, I am at his appointment. The bounds of my habitation are cast in Heaven. No further do I esteem of any mortal man than creatures in His hand, I fear none but the great Jehovah, which hath foretold me of these things, and I do verily believe that He will deliver me out of your hands. Therefore take heed how you proceed against me; for I know that for this you [are] about to do to me, God will ruin you and your posterity, and this whole state. There were angry jeers. She was denounced as a heretic and an instrument of the devil. The Court declared her "a woman not fit for our society." She was put under house arrest and then sent for a religious trial at the First Church in Boston. There she was accused of blasphemy and of "lewd and lascivious conduct" for having men and women in her house at the same time during her Sunday meetings. 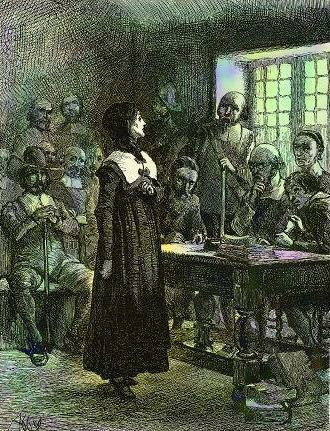 She was found guilty and excommunicated from the Puritan Church. She miscarried and the Church fathers proclaimed it God's judgment. She and some of her family moved to a colony run by the Dutch, settling in an area that today is now the Bronx in New York City. There the Dutch were involved in a series of incidents known as Kieft's War. In 1643 she was killed by rampaging Indians.